Create keepsake birth announcements the fast and easy way! 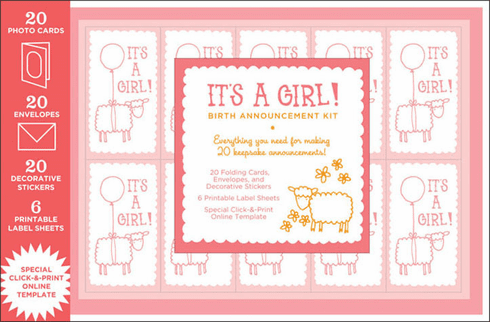 This deluxe kit is packed with supplies for making 20 adorable announcements, including illustrated folding cards with photo sleeves, envelopes, closure stickers, and printable announcement plates. With the help of an easy-to-use online template, new parents can customize their announcements to create one-of-a-kind mementos for sending to family and friends.